I met up with some friends tonight to try out the newly released edition of Kings of War. 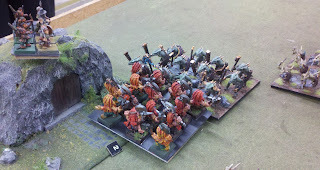 It was also the first outing for my new Dwarf army. I'd been slaving away for hours on Ebay to put the army together and was eager to see how they performed. 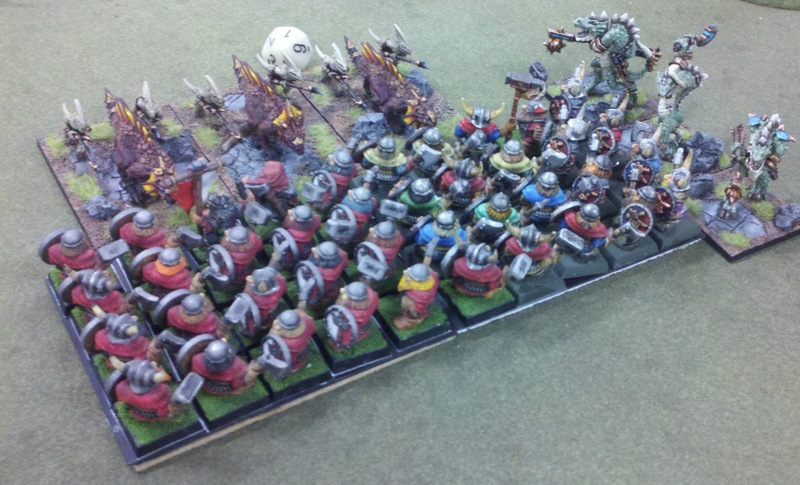 My Dwarven 1000 pt army was joined by an equally sized Dwarven army brought by another local gamer. Together we stood against a Liz-orc force (Lizardman figures using the Orc & Goblin lists). We rolled the Loot scenario for the game. 3 markers were placed along the midline of the board and who ever made it off with the most of them won the game. The number of units lost didn't matter in winning. The battle lines are drawn, lizards on the left, dwarves on the right, with my dwarves on the near side of the table. One flank of my forces: Ironclad Horde, Cannon, Berserker regiment, and Halfling Ranger troop. Off to the left of the picture are my Ironguard Regiment, another Cannon strategically placed on a hill, and another Halfling Ranger troop. My Halfling Rangers have the Vanguard special rule which allows them to make a double move before the game began. So one unit quickly positioned themselves on a big hill in difficult ground with a commanding view of the whole left flank. The other Rangers quickly advanced within 1" of an objective marker, in hopes we'd go 1st and grab the objective. Unfortunately, the Lizards got the 1st move, and a mounted hero grabbed the loot marker on his way to charging the Rangers. Surprisingly, the Rangers held out for a few turns while the rest of the Dwarves slowly rushed forward. 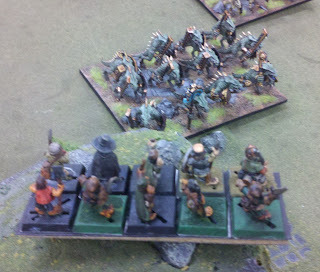 But the Lizard hero handed the loot to the Saurus Horde behind them & they quickly turned tail and run. while my Berserkers work themselves up for charge. The 1st battle on my side of the board found my Ironclad Horde charged by regiments of Salamanders (Fight Wagons) and Kroxigors (Trolls). Like the legendary Dwarves at the Hot Porridge Gates, they threw back their attackers and prepared to give as good as they got. On the other side of the board, my partner's Brock Riders completely destroyed the Lizard cavalry (Gore Riders) in the 1st round of combat, much to the surprise of the Lizard commander. 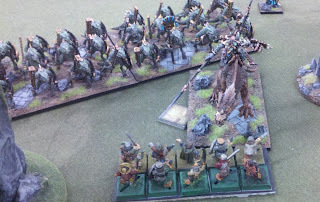 Unfortunately, this opened their flank up to a charge by both a Giant and a dinosaur-mounted bolt thrower. The Brock Riders took 15 hits and barely held on by 1 point. A Dwarven Greater Earth Elemental shambled into the fray, and a general scrum of heavy hitters surged back and forth for the rest of the game, all around one of the loot markers. 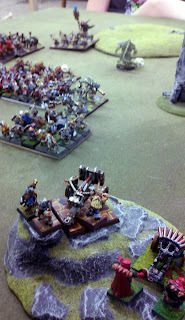 Back on my side of the board, all my dwarf infantry advanced into contact. Berserkers vs Saurus warriors (Orc Ax), Ironclads vs Fight Wagons again, and my Ironguard veterans caught the Kroxigors in the flank. 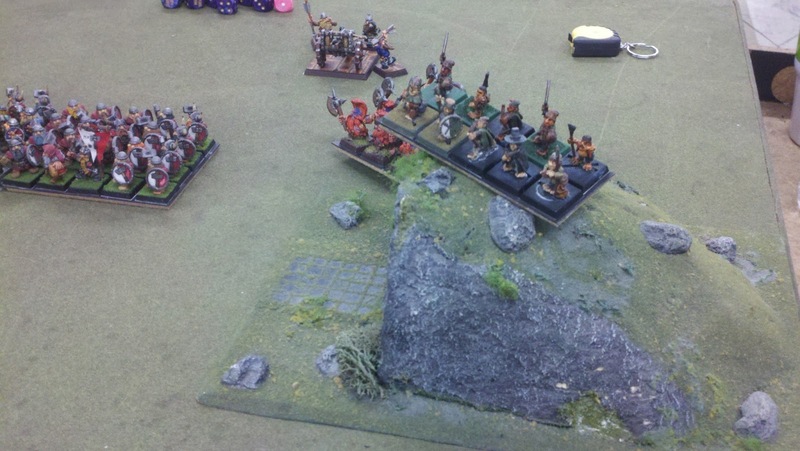 The Halfling Rangers continue to target the Skink (Goblin) archers in the back field as they cheer the Berserkers on. The melees surge back and forth for a short time. 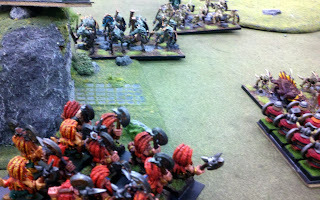 But weight of the Beserkers' and Horde's attacks quickly make short work of their opponents. 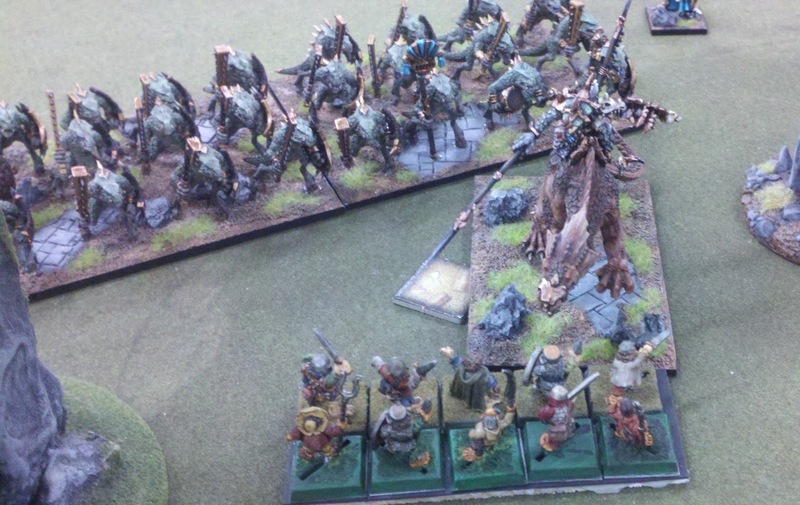 After running over the Saurus warriors, the Berserkers caught a unit of Skink archers in the flank. 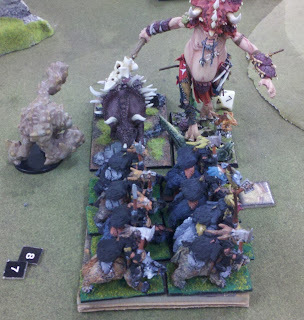 There was nothing left of the archers after the Berserkers rolled 50 dice in attacks. The Ironguard and Kroxigor were more evenly matched, both with good armor, so went at it hammer and claw for a bit longer. But victory was always assured for the steely Dwarven veterans, and they wiped the green gore off their boots before marching on. During all this time, the 4 war engines were pounding away at the Saurus Horde that had the loot, to try to slow it down so the infantry could catch up to it. Then suddenly, a Kroixgor hero picked up a 2nd loot maker. The hero made a juicier target, so the order was quickly given to switch targets and cut the hero down before he escaped. It became a desperate race between the plodding Dwarves and the slithering Lizards. The units with the loot ran for the back field, while all the other Lizards threw themselves at the Dwarven onslaught to slow them down. The Lizard Horde made it off the board with the loot without too much trouble. But the artillery was able to Waver the Kroxigor hero enough times that my partner's Ironclad regiment almost caught up with him. The Ironclad unit was about 2" too far away to charge the hero with the loot. The Dwarves probably would have won that melee & at least tied the game. But at the last minute we remembered the unit's Throwing Mastiff. With a grunt and a yelp, the canine missile arced through the air, landing square on the hero, savaging him mercilessly. But the hero missed being Wavered by 1 point and was able to make it off the board, with this tail still in the mastiff's jaws, thus ending the game. The 3rd loot marker was still being contested on the right flank as the Battle of the Titans raged on. The heavily wounded Giant was holding his own against the Greater Earth Elemental. But the Dino-bolt thrower, Lizard cavalry, Dwarven Brock Riders, and an Ironclad crossbow unit littered the battlefield around them. The Lizards achieved the objective by getting the loot off the table, but they only had a banner bearer and the wounded Giant left on the board. 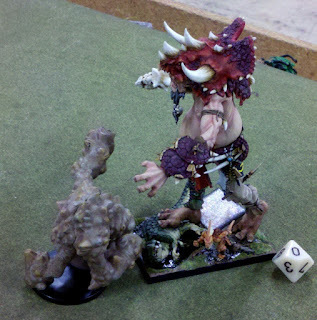 My only loss was the plucky Halfling Rangers who held off the Lizard hero on a Slasher beast. My partner lost the Brock Riders and a crossbow troop. So I'm sure you agree that the real winners were the Dwarves, causing 4 times as many points in casualties as they took. The game ran 8 turns and was great fun. The new edition changes made some subtle but significant differences. For example, there's no shooting penalty for long range any more. This means the Dwarven crossbow limitation of move or shoot isn't as much of an issue now. If well positioned, they can pretty much sit in 1 place and continue to fire all game. 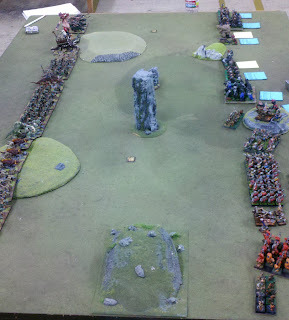 And with the armies starting 24" away, there's usually targets within the 1st move of the game. Adding Thunderous Charge (+1 damage) to the cavalry makes the units act like real cavalry. & having Thunderous Charge invalidated when charging through difficult terrain, or when you took damage last turn, makes it even more so. 2 gamers stopped by and watched our game for a while. Both had lots of questions, both had been long time WHFB players, and both were getting ready to try KoW out as a replacement. I also heard KoW is getting some regular play at another local store too. So the new edition is very well timed.